Windshield Repair in Los Angeles, CA. Before you go on a trip, make sure your preparation includes inspecting the condition of your auto windows. Driving with a chipped or cracked windshield isn't safe and you may get a "fix-it" ticket. If you are looking for a windshield repair in Los Angeles. 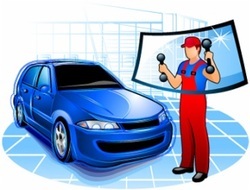 That offers mobile fast and convenient same day auto glass repair in Los Angeles. You came to the right place. Because the last thing you want is a shoddy job or leaky windshield, we hire only selected and experienced auto glass technicians. Your windshield is an important barrier that keeps you in the car. If you don't replace your windshield a cracked windshield (or a poorly installed windshield) can fail during a collision or roll over, allowing you or your passenger to be ejected. A passenger ejected from a car or truck is much more likely to experience a serious injury or death. Cracked windshields expose the laminate that joins the layers of glass in the windshield, resulting in delaminating. It is this delaminating that results in a dangerous reduction in the structural integrity of a vehicle. What's the difference between my windshield and the other glass in my car? Isn't glass just glass? No - there's a very important difference between your windshield and the rest of the glass in your car. ﻿How long does my car have to set after a windshield installation? ﻿How long will it take to replace my windshield? Auto Glass Ondemand can replace most windshields in about 1 hour.